Do not adjust the mirror while your vehicle is in motion. To adjust your mirrors: 1. Press the button to select the mirror you want to adjust. An indicator light on the button will illuminate. 2. Use the adjustment control to adjust the position of the mirror. 3. Press the mirror button again to deselect the mirror. The indicator light will turn off. Push the mirror toward the door window glass. Make sure that you fully engage the mirror in its support when returning it to its original position. The heated exterior mirrors switch on with the heated rear window. See Heated Windows and Mirrors in the Climate Control chapter. You can save and recall the mirror positions through the memory function. See Memory function in the Seats chapter. The driver’s side exterior mirror will automatically dim when the interior auto-dimming mirror is activated. Objects in the blind spot mirror are closer than they appear. Blind spot mirrors have an integrated convex mirror built into the upper outboard corner of the exterior mirrors. They are designed to assist you by increasing visibility along the side of your vehicle. Check the main mirror first before a lane change, then check the blind spot mirror. If no vehicles are present in the blind spot mirror and the traffic in the adjacent lane is at a safe distance, signal that you are going to change lanes. Glance over your shoulder to verify traffic is clear, and carefully change lanes. The image of the approaching vehicle is small and near the inboard edge of the main mirror when it is at a distance. The image becomes larger and begins to move outboard across the main mirror as the vehicle approaches (A). 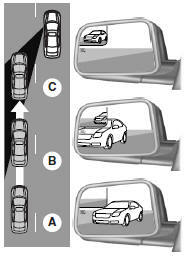 The image will transition from the main mirror and begin to appear in the blind spot mirror as the vehicle approaches (B). The vehicle will transition to your peripheral field of view as it leaves the blind spot mirror (C). Refer to Blind Spot Information System (BLIS®) with Cross Traffic Alert (CTA) in the Driving Aids chapter.